Data Detour: Where Is the Data? As an application developer for Century Corporation, you have been assigned the task of creating an income statement that examines the profit components of the company, including revenues, cost of goods sold, and expenses. First, you will create a project called FINANCIAL in the local projects area of the Developer Studio Explorer. This is where you access and create files. You will build your financial report within this project. Launch Developer Studio. The WebFOCUS Reporting Server is activated at the same time. Right-click Projects on localhost in the Explorer and choose New Project. The Create a Project wizard opens at Step 1. Name the project FINANCIAL and accept the default directory for the new project. Notice that the project name is registered as FINANCIAL.GFA (Graphical FOCUS Application). Note: Projects directories are created in lowercase. Directory financial does not exist. Do you want to create it? Click Yes to confirm the creation of the physical directory for the new project. The Create a Project wizard opens at Step 2. Specify a directory path to the data source from which the project needs to retrieve information. Choose ibinccen. This is the directory in which the sample files for the fictional Century Corporation are stored. You will be using some of these files to create your income statement. The Projects wizard displays your selection. Click Finish. Your new project appears in the Explorer tree. Click the plus sign (+) to expand the FINANCIAL folder. You will see several subfolders: HTML Files, Image Files, Maintain Files, Master Files, Procedures, and Other. Tip: These are virtual folders, categorized in this way for your convenience. They are called virtual folders because they apply a logical structure to the project but do not actually exist as physical directories. The files listed in these folders, along with the GFA file of a project, are actually stored on a WebFOCUS Reporting Server and a web or application server. Nevertheless, you can identify and access the files associated with a project from a folder in the local projects development area of Developer Studio, without concern for where the files really reside. To complete the tutorial, you will use the Master Files and Procedures folders. Notice that the icons are grayed out. This indicates that the files are available, but not active for your project. 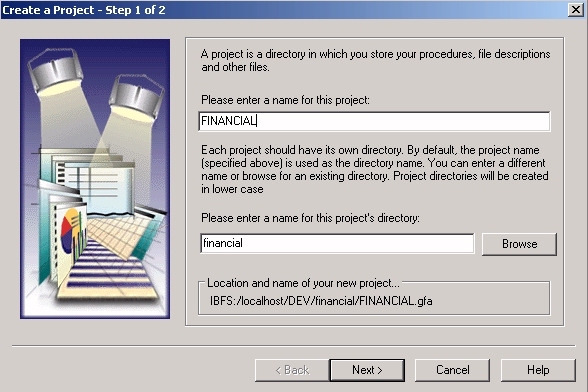 Associate the Master File you will need for the tutorial with the FINANCIAL project. Select CENTSTMT and click the Add icon on the toolbar (or right-click and select Add to Project). The icon for this Master File is active for your project. Click the binoculars icon to limit the list to the active Master File. Tip: You can toggle back to the full list at any time. Detour briefly to see where the corresponding data is stored. Expand WebFOCUS Environments. The WebFOCUS Environments area of the Explorer shows the actual files that reside on the WebFOCUS Reporting Server and the web or application server. Double-click localhost under WebFOCUS Environments. This is the Reporting Server installed on your local machine. Open Data Servers, followed by EDASERVE, then Applications. Expand the folder labeled ibinccen (this is the directory you cited earlier as the location in which the data for your project is stored). Organize the list by Type. Double-click the Master Files folder. Scroll down to see the full list of Master Files available on the path you identified, including the one you added to the project, CENTSTMT.MAS. Then scroll back up to see the corresponding data source, CENTSTMT.FOC. 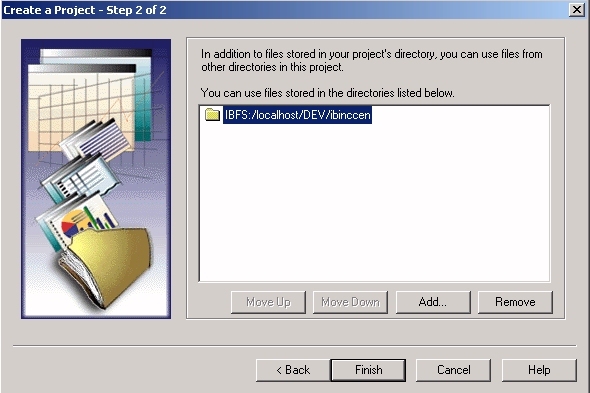 The Master File is visible in the virtual folder in the local Projects development area, but the data source file is only visible on the server itself. When you run a report later in this exercise, WebFOCUS will identify, locate, and read the active Master File (.MAS) for the data source (.FOC) named in the request. It will then interpret the contents of the data source based on the information in the Master File. You do not have to make the data source files active. 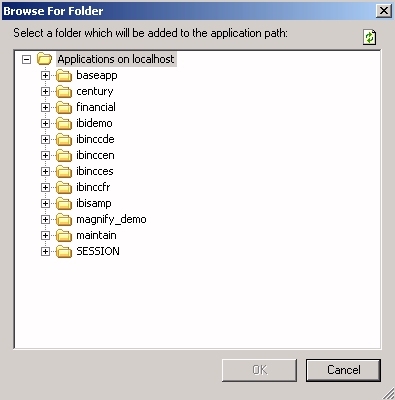 Notice that the ibinccen folder also contains some sample procedures in the Procedures folder (.FEX files). You will not be using these procedures. (They have been created for use in demos and other exercises.) For this tutorial you will create your own financial reporting procedure. Close WebFOCUS Environments since you will create the procedure in the local projects development area.